After over 35 years of development and helping other designers and engineers, The Workbench site will be closing due to age and retirement of members. Sales of certain items in stock will continue until depleted. The basic site will remain open for some time for item documentation. If you have any special request please email. If you stumbled here by accident or came intentionally - Welcome to the Workbench! A place started by a couple of micro controller enthusiasts. As you click your way around you may find some useful software utilities or information. Most of the boards and designs are results of engineers helping each other during development of projects. As needs change so do the projects and adapters. Below are the current boards. Previous projects are slowly moved to the archived section. A small RS232 adapter using a Max233. Use for connecting microcontrollers to PCs or other terminals. 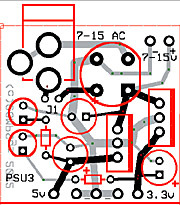 Schematic and PCB (kit or bare) available. 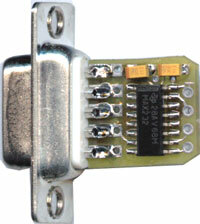 ST232SA 3.3v TTL to RS232 adapter module has a 3.5MM stereo jack which provides three lines, Gnd,Tx and Rx. 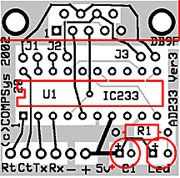 The board provides jumpers to configure the jack’s Tip and Ring as Tx or Rx. It comes as assembled or as a kit. Will work on 3.3v to 5v....more info. RJ45SA 3.3v TTL to RS232 adapter with an RJ45 jack. It provides connections for Tx,Rx,Cts and Rts. The pin connections on the RJ45 are Lantronix compatible. It comes as assembled or as a kit. It will work on 3.3v to 5v....more info. A232DTE 3.3v TTL to RS232 adapter configured as a DTE adapter with a male DB9 connector. It comes as assembled or as a kit. It will work on 3.3v to 5v. 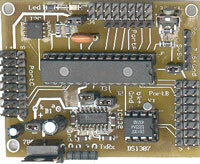 A232DBL 3.3v or 5v Dual TTL to RS232 adapter board. Designed for engineers/hobbyists who need an adapter without a DB9 connector so that they can wire their own. The board provides two separate TTL to RS232 I/O channels, each has Tx and Rx lines. The adapter is available as a kit or assembled....more info. The UFT232R A USB to TTL RS232 kit. it is based on the new FT232R chip by FTDI. The new chip reduces the components required and yet provides all of the extended functionality. Available with a Type A or Type B USB connector. More info..
Mini Power Supplies for breadboards 5v, 3.3v and dual voltage modules for quick prototyping and projects. Standard .1” pins easily connects to pcbs and development boards. The tiny PSU5-3A provides a 5v dc source using an LM7805 and PSU5-3B provides 3.3v using an LM2937. Includes a power LED. Input 7-15v DC via a 2.1mm power socket. PAST PROJECTS: Some parts/kits are still available. If you are interested please email. Seiko-Epson SED1330, Samsung KS0108 and Toshiba T6963C based displays. The T6963C and SED1330 adapter for LCD displays up to 256x128 pixels. It provides the negative -15v for the display bias. Straight 18 pin as well as a 2x10 pin headers to accommodate most displays. It connects directly to the GLiPIC controller. 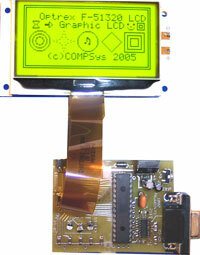 Sed1330 based large 256x128 Graphic LCD which can be used with the GLiPIC board! 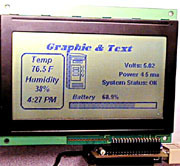 Unlike the venerable HD44780 based character LCD, graphic LCDs do not have any ad-hoc standard. Small graphic LCDs come in many different flavors, configurations and sizes. Some have on-board dedicated graphic controller chips and some do not. All graphic LCDs require a negative voltage to drive the displays contrast. The amount varies with the physical size of the display. Usually, 240x64, and less, require -10v, 256x128 need -15v and larger displays may require up to -24v. To further complicate matters, this required negative voltage is usually not provided by the LCD itself. This means additional circuitry. To drive an LCD without an on-board graphic controller with an 8 bit micro would be daunting, indeed, and is beyond the scope of the Workbench boards. All of the COMPSys Workbench development boards rely on LCDs with controllers. This usually requires 12-16 pins of the micro, and leaves the rest of the micro’s pins for the user to implement for other uses such as I/O, analog readings, buttons, keypads etc. Some graphic LCDs even have a serial interface requiring only a handful of connections. Three of the popular controllers for small size displays are the Seiko-Epson SED1330, Samsung KS0108 (akin to the Hitachi HD61202), and the Toshiba T6963C. Most of the LCDs that use these controllers have an 8 bit data bus along with 4 to 6 control lines. The Workbench controllers are configured to work with most of the above controllers. 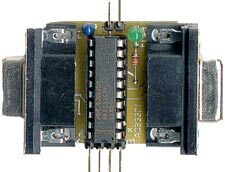 Since pin arrangements vary from one manufacturer to another, adapters become a necessity. All of the LCDs mentioned here a 1 bit color displays (black/white) and are not capable of grayscale shades. Designed for use with KS0108 Graphic LCD controllers, however it can be used as a general purpose controller. Plus, with the available adapters it can be used with other LCD displays such as those that have a T6963C or SED1330 controller. The adapters provide the correct pinouts as well as the negative voltage for the displays. The GLiPIC board houses a 20MHz 16F877, Max232, 24LC256 I2C eeprom and an LM7805 regulator. GLI2 - The new GL series 20Mhz controller board. Same compact size as the original GLI board but has an on-board -15v power supply to drive LCD panels up to 256x128 in size. Low cost adapters available for most of the popular graphic controller LCD displays, such as the SED1330, T6963C, KS0108, and the HD61202. Uses a PIC16F877 mcu, Max232 serial transceiver, 24LC256 I2C eeprom, a Max637 voltage booster and an LM7805 voltage regulator. The controller’s PORTA and PORTB pins are available for other uses and are brought to pin outs for easy connections. Requires 7-20v DC power supply. On-Board 32kb eerpom storage for images. Can be programmed serially with a bootloader. Can be used with the new PIC18F452 controller for added programming space. With minor chanages in pin assignments it can run the same firmware as the original GLiPIC board. The kit requires soldering a few surface mount components. Click here for more info about the board and the adapters. 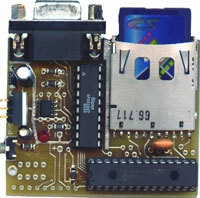 A small development kit which connects to an Optrex 51320 COG (chip on glass) graphic LCD. The dot matrix LCD has an LED backlight (5v). The board includes a 28 pin DIP PIC16F876 with 8k code space (many other 28 pin PICs can be used if more programming space is required). 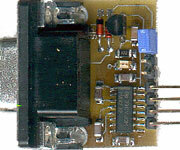 There is an on-board 5v power regulator as well as an RS232 IC (Max232 or equiv). It also has provisions for an optional I2C eeeprom and pull up resistors. 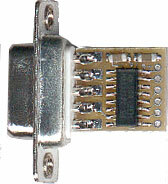 Unused pins, such as PortA, are available via pin headers. 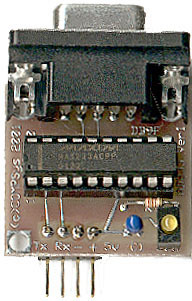 The PIC’s programming pins are brought to a header so that the PIC can be programmed using a conventional PIC programmer. An alternative, method is to load the PIC with a bootloader and then program it via the board’s serial DB9 connector. Sample PICBasicPro code is available in the Workbench Support section. The kit is available with or without the LCD. Source code written in PBP V2.47 available. This allows one to read/write to a single file on a FAT16 formatted MMC. Ideal for long term data logging by providing large storage space. Handy, small, versatile general purpose controller boards for 28 Pin PIC microcontroller. Perfect for quick projects, robotics or use as a handy bench tool. Includes two eeproms (for data storage). Tiny footprint can fit small project enclosures. With a bootloader, the PIC can be programmed serially. 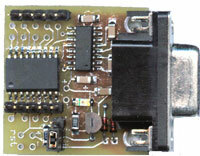 The BOTB2 board was designed for a robotics project that required controlling servos and a variety of sensors.The board can use a 16F876 or 18F252 PIC. Headers are provided for power as well as the PIC’s pins. It has provisions for an RTC (DS1307) clock, a Max232 SOIC, an I2C 24CL256 eeprom, on-board power regulator, power LED, a programming header and several jumpers to enable/disable on-board or external power for devices. On the right, the A232P88 compact controller board which includes a PIC16F88, a Max3232 IC, and voltage regulator. It can be powered externally or can draw its power from the PC’s serial lines. The PIC can be programmed via a 5 pin header.Ideal for small sensor projects. Windows is a registered trademark of Microsoft Corporation. PICMicro is a registered trademark of Microchip Inc.